How are the Urban Sketchers and Plein Air Painting movements related? As an artist with a hand in both and with our upcoming combined show, the Urban Sketchers Chicago Holiday Showcase, with Featured Guests, Plein Air Painters of Chicago 11/21-12/13/2015, let’s examine similarities and differences. Technology had something to do with the formation of both. Plein Air means "in the open air" or simply, “outdoors.” The technological advance of paint in tubes allowed artists in the mid 1800s to explore nature and capture the effects of sunlight in the moment. Urban Sketchers is about drawing on location, in a supportive, global community. The internet was key to its formation and is integral to the global sharing aspect. Both groups create images on location, in the moment. With some exceptions, the size of our drawings and paintings tend to be small, for reasons of both portability and time. We travel with our materials. Watermedia (watercolor, gouache, and casein) and digital tools are used in either. Of all of these, watercolor is the most popular crossover medium in my experience. We’re both interested in capturing the Truth of a place and time, exploring the world around us. There are exceptions to all of these items, however, in general, the differences tend to be about time and materials. Plein Air Painting tends to take much more time per image and is painted with paint or pastels. Urban Sketches can be created in much less time and may use any material. 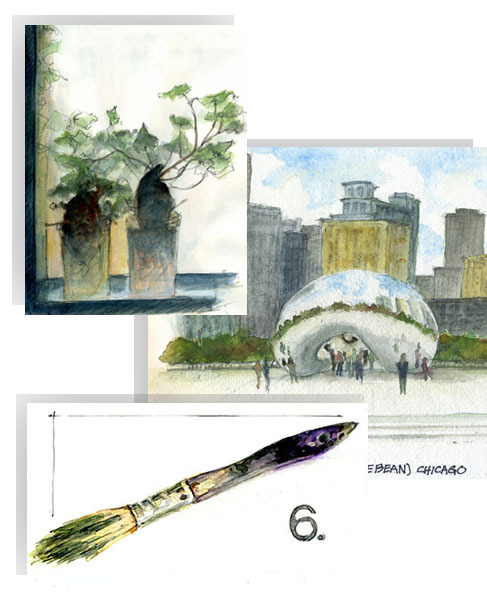 Urban Sketches tend to be even smaller than a typical plein air painting. When you consider that an Urban Sketch might be drawn on a pocket-sized sketchbook while waiting in line, as opposed to being created on an easel set up for several hours, you can understand why. Urban Sketches, without question, can also be drawn indoors. 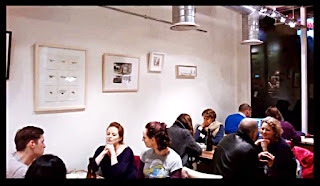 Cafes, museums, and concert venues are all typical Urban Sketchers venues. Exceptions prove how similar these efforts are. 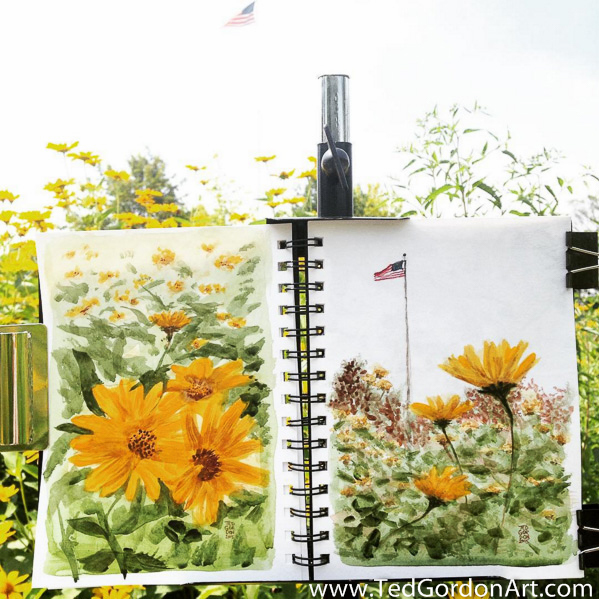 In both Plein Air Painting and Urban Sketchers, the world is our studio. Based in its journalistic roots, Urban Sketchers aims to tell the story of our surroundings. Urban Sketches are far more likely to contain text within the work than in a Plein Air painting. The story of a Plein Air painting can be much less literally narrative. For instance, the story could be about what the sunlight is doing during your painting or how intensely blue that boat is. 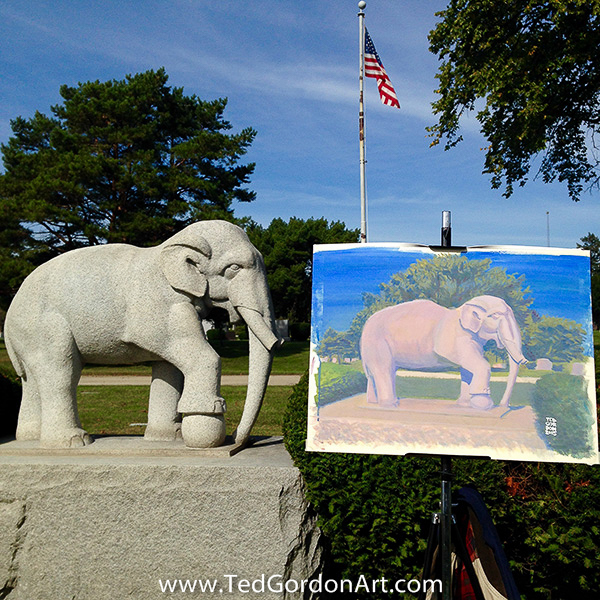 Plein Air is almost always done on an easel. Urban Sketching sometimes is, but often isn’t, for mobility and quickness. While Plein Air paintings are made with paint or pastels, Urban Sketchers draw with any kind of media and wildly individual styles. Plein Air styles, while they can be quite varied, aren’t as divergent as the Urban Sketchers styles can be, in my opinion. Urban Sketchers tends to be more casual, mobile, and quick. Urban Sketchers’ subjects are more likely to have a person or an action as the subject. In contrast, plein air paintings often take much more time to complete and are more likely to contain natural environmental or architectural subjects. Plein Air painters are more likely to edit an environment for aesthetic purposes. A tree might move or wires might be omitted without feeling that the truth of the place had been compromised in plein air. Lindberg Park, painted in Winsor & Newton watercolor on location. 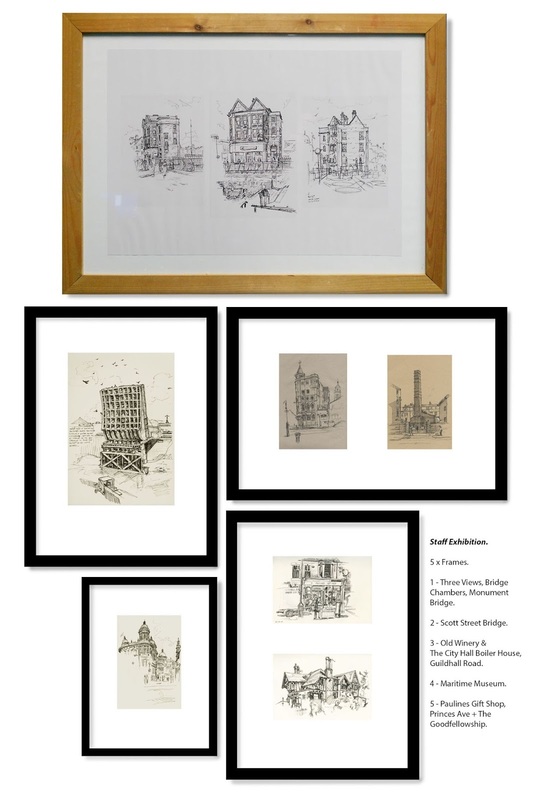 Are these Plein Air or Urban Sketches? Yes! In conclusion, I think that some of the differences are superficial, while others are very strong. Which you are doing at a given time may have more to do with your equipment and intention than anything else. There are definitely times when the lines are blurred. To be clear, I don't make a value judgement between the two and there's no reason you can't do each in the same day. For artists that like to experiment, I encourage you to try both! What do you think? 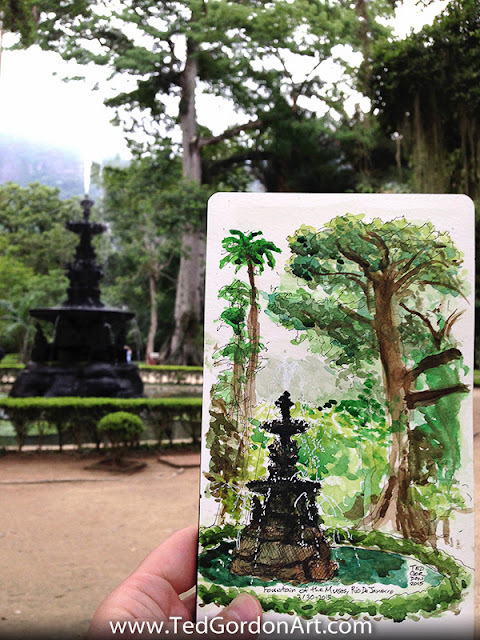 In what other ways are Urban Sketchers and Plein Air Painting similar or different? Did you know that until the late 1920s - early 1930s drawing was part of the regular school curriculum? While not one of the 3 Rs, it was considered an important tool for developing concepts, sharpening thought, and sharing ideas. What happened? One of the major factors was the development of photography made drawing seem like an unnecessary skill. In more recent years, computer advancements in the visual communication field made drawing appear to be unimportant even unnecessary but things are changing. Whether it’s called drawing, sketching, or doodling, today, we’re rediscovering the benefits of drawing. If you're an experienced artist looking to reboot or a newbie looking for kindred spirits, this is for you. Drawing relieves stress, preserves a memory, and conveys ideas. We know the benefits of drawing; it only makes sense to draw more. Want to draw more but need a nudge? It’s funny that two of the causes for drawing less are big helps to start drawing more – the computer and the internet. 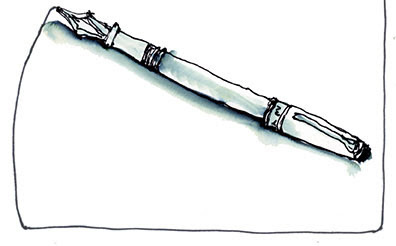 There’s an internet group out there made just for you and your sketching needs. FaceBook offers an almost endless list of groups that unite like-minded sketchers for encouragement, inspiration, to share information and sketches. There are drawing quests issued on Facebook, Twitter, and Instagram to challenge you to draw more. Post your work, add the proper # and join in the fun. Here’s a small sampling of groups to get you started. Don't hesitate to explore others, too. Be sure to read the groups’ guidelines and join those that are a good fit for you. Working for years as a graphic designer, I reached a point when I felt handcuffed by the computer and missed the creative boost of sketching by hand. That's when I discovered Urban Sketchers and Everyday Matters. They were the beginning. There was no turning back! I found I didn't need an excuse to draw, I had reasons to draw. How about you, why do you draw? Do you have a favorite group? Have you ever wanted to enter your urban sketches into an art show? Here is your opportunity! Blick Art Materials of Lincoln Park has generously offered to host a Holiday Plein Air Art Fair and Holiday Showcase for the members of Urban Sketchers Chicago and the Plein Air Painters of Chicago. First, submit your artwork for a chance to be featured in a special Holiday Showcase, running 11/19-12/13, with participation prizes for all artists submitting*. 12”x12”, reproductions accepted. Urban Sketchers and Plein Air Painters create their work on location. All art submissions for showcase must have been created on location. shown must be received in-store no later than 11/15/15. prizes available while supplies last. ** As space allows. 10 total slots offered, distributed evenly between group affiliations. First time preparing for a show? 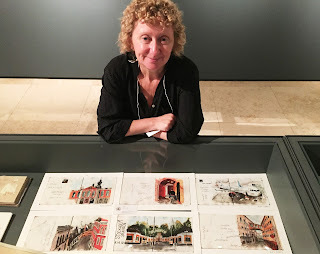 Read Alex Zonis's TTT post "Showing Your Sketches at an Exhibition." 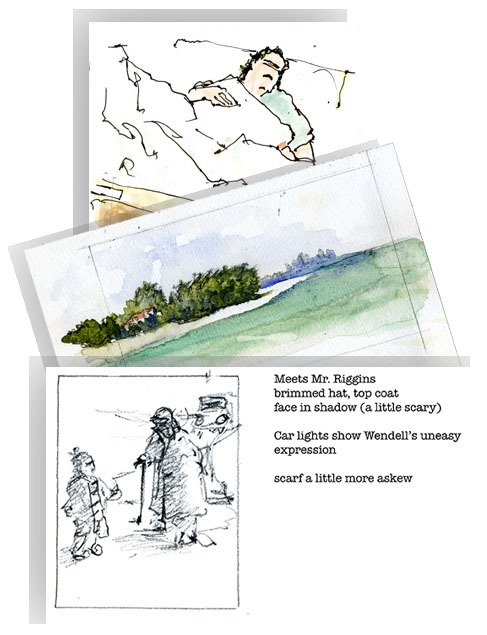 Does the show call for individual sketches or sketchbooks? Does the show plan to display sketches flat in display tables or hanging vertically on a wall? Does the show call for original work or printed copies are accepted? 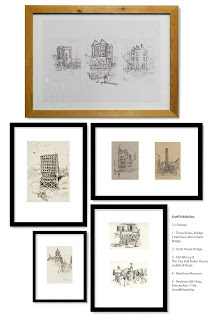 Individual, original sketches and prints on paper can be displayed flat in glassed display cases without major preparation. If the original work has reasonable margins, it is good to go. If the image is developed to the edge of the paper, it will look more professional if attached to a bigger sheet with an inch of border showing. Attach the original work with framer tape or low adhesive drafting tape, positioning it at the back of the work hidden from view. I prefer not to use glue, but if you want to go this route, spray adhesive and a brayer tool will work well. If the original work will be printed, it is a good idea to use paper that resembles the paper of the original. I prefer my prints of sketches to be on matte paper. Leave at least one inch border on all sides. If the show calls for the work to be hung on walls, then we get into matting and framing. The expense of framing can rise rapidly, but it does not have to. There are a lot of good possibilities that will not break the bank. First, consider using a standard frame, not a custom built one - standard are more affordable. For pen, pencil, marker, or watercolor work, simple narrow frames with clean geometric profile work best. Don’t even think of metal frames! While less expensive, metal frames look tacky! Narrow wooden frames in natural colors - white, black, light wood - are probably the best because you can reuse them for the next show. Colored frames are an interesting approach if the color works with the image. I’ve seen watercolors in red and yellow frames that looked very good. Still, I prefer neutrals. 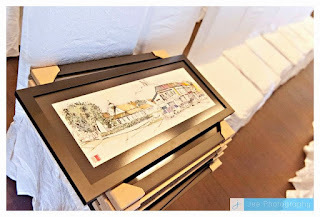 If your image is not a standard size, you can still use a standard frame, but have your mat cut to a custom size opening for the the drawing. It is cheaper to customize the mat than to have a custom frame made. 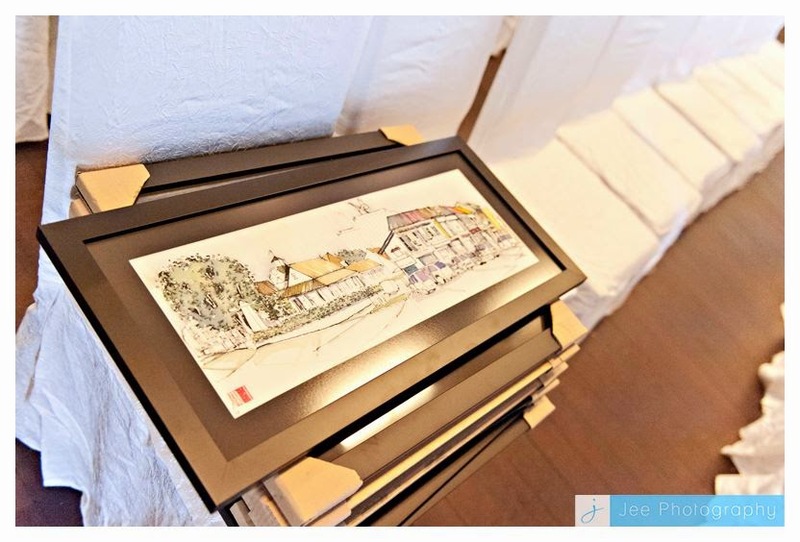 A different way of using the mat is to not cut an opening, but place a drawing on the uncut mat, on a correct spot, secure it unobtrusively with a piece of framing tape on a back and set it in the frame behind glass or plexi. If it is an important, invitational, or career-making show, then splurge and frame with glass. If it is a local show or a pop-up gallery or a cafe show, plexi is probably a better way. Besides they do plexi very well now, it is very clear. It is a good idea to learn basic framing and do it yourself. I have a framing point driver and a small power drill and do a lot of my framing tasks myself. I do not build frames, that’s a different level entirely and requires expensive equipment. But I buy frames online and set my pieces in them myself, switch work from frame to frame, in and out for different shows. This is simple to do and saves a lot of money. Packing work for delivery or shipping is rather straight forward. Avoid using crumpled paper for padding and protection. Many galleries ask for no packing peanuts - too much cleanup. Once you start showing, you will find yourself on a constant look-out for cardboard boxes suitable for framed work. Better to find and re-use a box than to buy new and waste more paper resources. 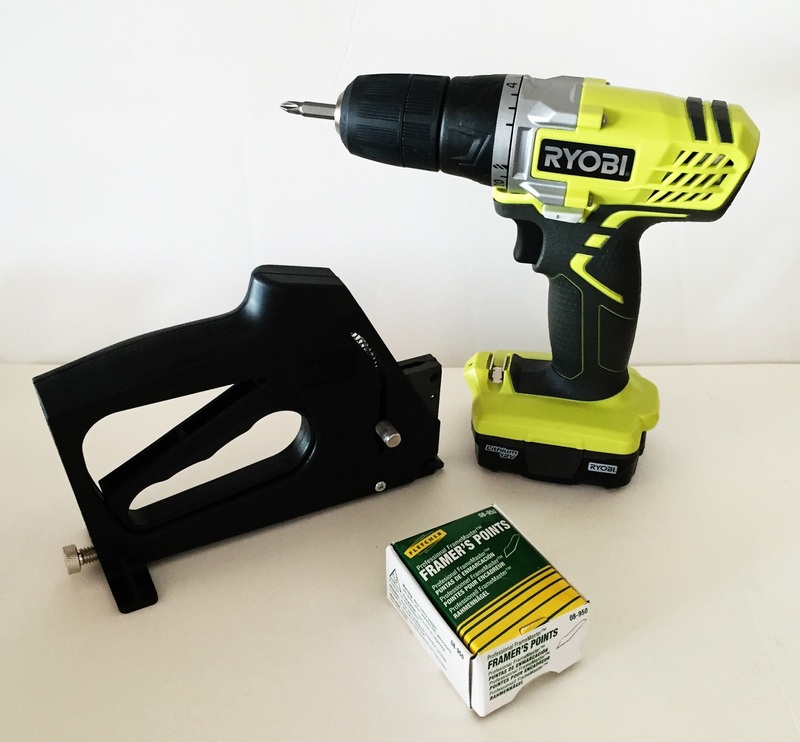 A tip for box-hunting: if two dimensions - length and width - are suited for your piece, you can cut down the height with a box cutter. 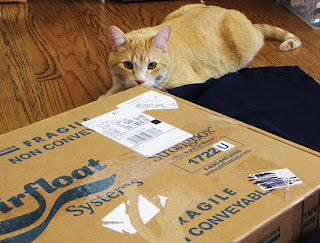 Another tip: Amazon has great boxes! Galleries are lately beginning to ask for a specific type of box. As a precaution against shipping damages, they may ask for Airfloat box or StrongBox - airfloatsys.com. It is a great reusable box with foam cushioning, but expensive. Something to think about. Be sure to have your work signed on the back before packing it. Put your name on the box in big letters using a wide Sharpie. The gallery will thank you when packing your work to send back to you. If the show is local, you are in luck. Even a long drive is better and more reliable than shipping. I have driven 50-60 miles to deliver work, and I know artists who drove 100-120 miles to avoid shipping. If you can, do it. But if the show is in Italy or South Africa, then the work must be shipped. Choosing a carrier for your shipment is always an agony. USPS is the most affordable option and also most unreliable. USPS works well for domestic shipping, it is the international delivery where things can go haywire. They have never actually lost my work, but have often been very late delivering it. Case in point: I’ve been promised 10-14 business days to deliver an envelope with drawings to Cape Town SA. It is now 4 weeks later, the show already started, no sign of my package. Allow ample time! UPS and Fedex are good and reliable carriers. They get high marks for delivering on time, but they are expensive!! Galleries also ask for prepaid return shipping label to be included with your work. The cost of doing business…. Do attend your openings as much as you can! It is a great opportunity to connect with other artists and perhaps establish business connections. Bring your business cards and give them out liberally! If you are an introvert, brace yourself and make the effort. Visit your showing gallery early, before the opening, and meet gallery director/owner, introduce yourself and chat. Do not engage the gallery staff in a chat during the opening, leave them to do their job promoting and selling your art. Have your portfolio handy, but not in an obvious way. If the opportunity presents itself, you will be glad you had it. Do your research before traveling to the opening - are there other galleries in that city that could be of interest to you? If yes, make an appointment to visit. That portfolio will be useful again. Most of the time the gallery is doing sales, you pay them with a percentage of sales. 50-50 split with a gallery is customary, if the gallery asked for less - it’s great, more is considered gouging. Pricing work is a whole another topic, better addressed separately. Smaller venues and art fairs require you to be responsible for your own sales. The easiest way is to accept cash and checks. But art browsing public likes to pay with a credit card. This used to be difficult and require an awful gadget that would always get stuck at the worst moment, but not any more. Get PayPal Here app on your smart phone, with or without a swiping device, and you are in business! See you at your next show!! What is Graphic Recording? *Graphic recording is the skill of listening, synthesizing and transforming the spoken word into a visual language in real-time. They are rich, visual notes created from a blending of handwriting, drawings, hand-rendered display type, shapes, and visual elements to help capture the essence of a speech, presentation or performance. The goal is to take a complex narrative and break it down to its essential elements and create a memorable, easy-to-understand low-tech summary on paper large or small. (That is me at the large board). - Drawing quickly and from memory is a must. USK equivalents: rooftops, tents, umbrellas, milk carton, caps on building, caps on banisters, yield sign, caution sign, school crossing sign, porch roof, bike frame, navigational/directional signs, FedEx tubes, windows, railroad crossing, safety cones. USK equivalents: wheels, coins, manhole cover, tokens, street lights, wrong way sign, donuts, bagels, cupcakes, pizza, plates, porthole window, the sun/moon, coasters, capital building, arches. While this may not be an all-inclusive list, these are the similarities I have found whenever I am graphic recording. I hope that I have impressed upon you the value of urban sketching and how it can manifest itself into other forms of art and design. 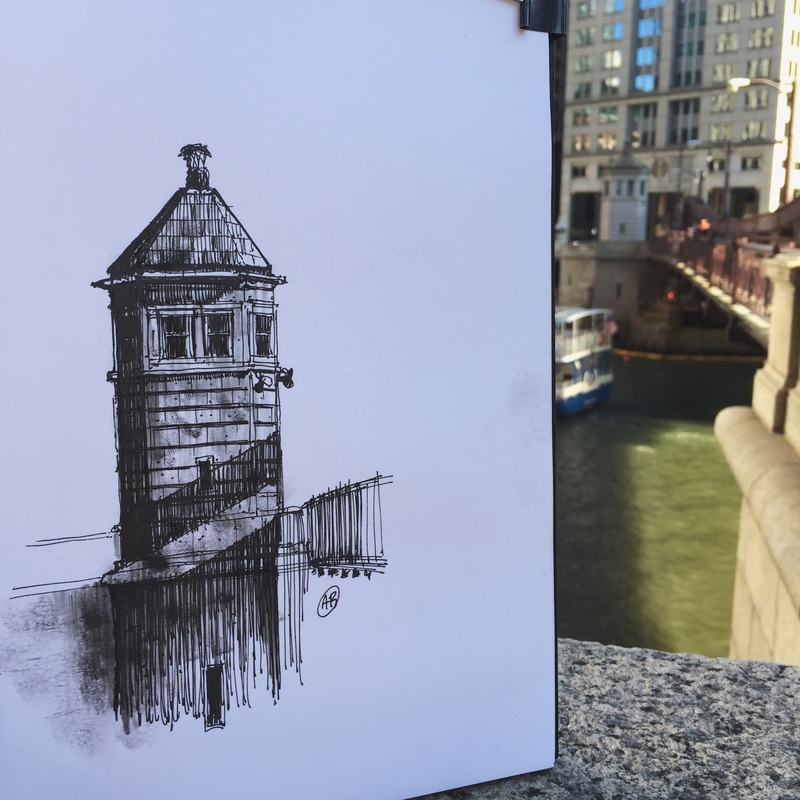 Urban sketching, I have found, is one of the best ways to keep your sketching skills sharp and ready for all kinds of applications, even if your day job does not entail illustration. Graphic recording is one way I have found to incorporate sketching in a business or classroom environment and empowers better recall of information. If you have any further questions on graphic recording, please ask below in the comments section. *Note: Other labels commonly referred to this art form: visual thinking, visual notes, graphic notes, sketch notes, graphic scribe, and creative meeting notes. A couple weeks ago I had the opportunity to spend an afternoon in the loop, riding my bike, sketching and taking photos. One of the reasons I love living in the city is the ability to hop on Lake Shore Drive bike path and just ride and see where the day takes me. After a recent guided kayaking tour I took with my wife on the Chicago River, I was inspired to return to one of the major stops, near Merchandise Mart and the recently finished river walkway. I found a nice spot on the Franklin Street Bridge. 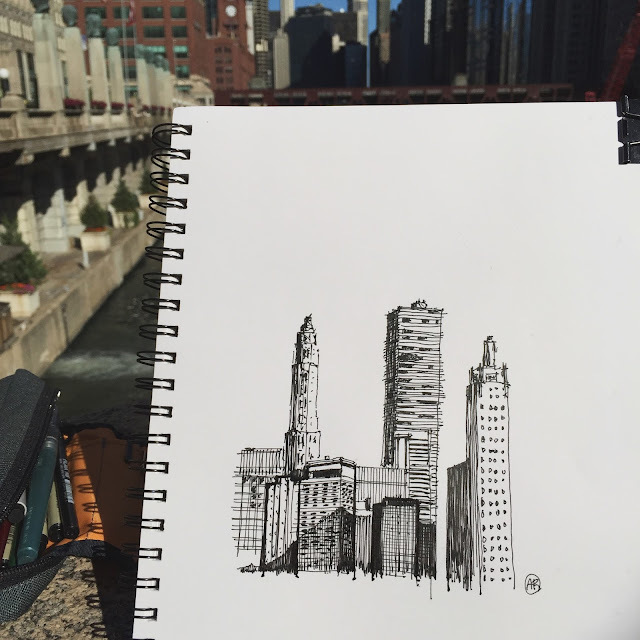 With a great view east, down the river towards Michigan Avenue, I started off with this loose ink sketch of the skyline. I normally like to lay out my sketches in pencil, but just decided to go for it in ink with this one. I tend to be a perfectionist. I like to spend my time making a sketch work well, often times, too much time. However, diving right into this ink drawing was a real nice change of pace and really freeing, creative experience. Instead of making sure each line was completely straight, I allowed the pace of my drawing to dictate the characteristics of the sketch. All in all, I was really pleased with how it turned out and was able to capture the essence of the skyline with gestural lines, stippling and some hatching. The beautiful thing about being in the Loop is that there is nearly an endless supply of things to sketch. Having finished the skyline sketch, I stayed in the same spot and sketched the Franklin Street Bridge House, which was a lot closer to me and allowed for some greater attention to material, proportion and detail. The lighting and shadows were changing very fast so I penciled in a rough outline and indicated where the shadows were at the time. By the time I finished the pencil sketch, the shadows had already changed and disappeared. I then inked the drawing with a fountain pen and Faber Castell Cold Grey IV 233 PITT artist pen. These two sketches were both done in a Stillman and Birn Epsilon sketchbook, which has become my go to sketchbook for pen and ink sketching. For a long time, I have had a tendency to go back and forth between one sketchbook and another. I would bounce between a sketchbook geared toward watercolor, to one with ivory colored paper to another with grey toned paper. But, I've enjoyed this Epsilon paper so much, I've been diligent in filling it up. This sketchbook is shaping up to be one of my favorite collections of sketches yet. I look forward to filling it up and seeing where the rest of the pages take me. You can see more of my work and sketches on Instagram: @abillustrator and my professional website www.AndrewBanksIllustration.com. I am trying to savor the last precious days of nice outdoor sketching weather before Chicago winter returns.